Bodhidharma (Sanskrit: बोधिधर्म Chinese 菩提達摩, Japanese ダルマ), was a legendary Buddhist monk who lived during the fifth and sixth century C.E. and played a seminal role in the transmission of Zen Buddhism from India to China (where it is known as Chan). He is considered by Zen Buddhists to be the twenty-eighth Patriarch in a lineage that is traced directly back to Gautama Buddha himself. Bodhidharma is also credited with founding the famous Shaolin school of Chinese martial arts and is known as a Tripitaka Dharma Master. Details concerning Bodhidharma's biography are unclear because major sources of information about his life are inconsistent with regard to his origins, the chronology of his journey to China, his death, and other details. The primary sources of his biographical details are Yang Xuanzhi’s Record of the Buddhist Monasteries of Luoyang (547 C.E. ), Tanlin's biography of Bodhidharma found in the Long Scroll of the Treatise on the Two Entrances and Four Practices (sixth century C.E. ), Daoxuan’s Continued Biographies of Eminent Monks (645 C.E. ), and the Anthology of the Patriarchal Hall (952 C.E. ), written by two students of Hsüeh-feng I-ts'un. These accounts of his life are filled with mythical elements, making an historically accurate biography impossible. What is more significant is the meaning that his stories hold for Zen Buddhists, and how they continue to influence the tradition today. Not dependent on the written word. Seeing one’s own true nature, and attaining enlightenment (Mitchell 2002, 201). 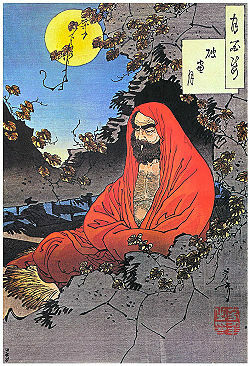 Bodhidharma was not a prolific writer or philosopher like other Buddhist figures, yet the central elements of his teachings can be seen in stories of his life such as his emphasis on zazen, his style of interacting with students (often referred to as “dharma-dueling” and found in many koans), the lack of emphasis on scholarship and intellectual debate, and the importance of personal realization and mind-to-mind transmission from teacher to disciple. These distinctive features that Bodhidharma brought from India to China almost 1,500 years ago still define Zen Buddhism today. Another characteristic feature of Bodhidharma’s presentation of Buddhism was the emphasis he placed on physical well-being. He taught that keeping our bodies healthy increases our mental energy and prepares us for the rigors that serious meditation practice requires. Bodhidharma's mind-and-body approach to spiritual practice ultimately proved highly attractive to the Samurai class in Japan, who incorporated Zen into their way of life, following their encounter with the martial-arts-oriented Zen Rinzai School introduced to Japan by Eisai in the twelfth century. A blue-eyed Buddhist monk, possibly Bodhidharma, forming the Vitarka mudra (Symbol of teaching the dharma), in the direction of an East-Asian disciple. Eastern Tarim Basin, China, ninth-tenth century. During his travels in China, Bodhidharma stopped at the Shaolin temple at Mt. Song but was refused entry. He is said to have subsequently sat in meditation outside the monastery facing its walls (or in a nearby cave in other accounts) for nine years. The Shaolin monks were so impressed with his dedication to his zazen that he was finally granted entry. However, it is reported that after sitting for so many years in meditation, Bodhidharma lost the use of his legs through the process of atrophy. This legend is still alive in Japan, where legless Daruma dolls representing Bodhidharma, and are used to make wishes. Even today, zazen (sitting meditation) is an important part of Zen Buddhist practice. However, the story of Bodhidharma losing the use of his legs contradicts other legends about him founding martial arts to combat physical weakness. It was traditionally held that this meant that Huike had understood the "marrow" or heart of his master's teachings, while Daofu understood the least. However, Dogen, founder of the Soto school of Japanese Zen, taught that they in fact all understood his teaching, and thus were each given a symbol of their understanding. Only one could be the head of the lineage, so he gave the Buddha’s begging bowl, his robes, and a copy of the Lankavatara Sutra to Huike. The meaning of this exchange in intentionally ambiguous, as it is part of a koan (Master Dogen's 300 Koan Shobogenzo, Case 201. See http://www.mro.org/zmm/dharmateachings/talks/teisho18.htm for the full koan and a discussion of its meaning). Broughton, Jeffrey L. (1999). The Bodhidharma Anthology: The Earliest Records of Zen. Berkeley: University of California Press. ISBN 0520219724. Red Pine, translator. 1987. The Zen Teaching of Bodhidharma. New York: North Point Press. This page was last modified on 14 June 2016, at 15:46.